Team Spirit Chocolate Popcorn will quickly become your favorite snack to enjoy while you cheer on your favorite team. Use candy melts in your team colors to personalize this delicious sweet treat. When I’m sitting in front of the TV, whether to watch a movie or this week’s game, popcorn is my go to snack. The light, crunchy texture is irresistible to me and just a bit addictive. I’m normally more of a savory popcorn kind of person but every once and awhile I enjoy a sweet version too. Especially when it boasts my teams colors. We are firmly Husker fans in this house, even though this season has been almost unbearable to witness. Joel and I both graduated from the University of Nebraska and it’s pretty much impossible to not become a fan when you experience Lincoln, Nebraska on a game day. So that means of course that we’re all about that red. Back to the popcorn. It’s so incredibly easy to make for your next game day gathering. We’re talking just 4 ingredients and a few minutes of your time. The ingredients and candy melt color will depend on your team colors. 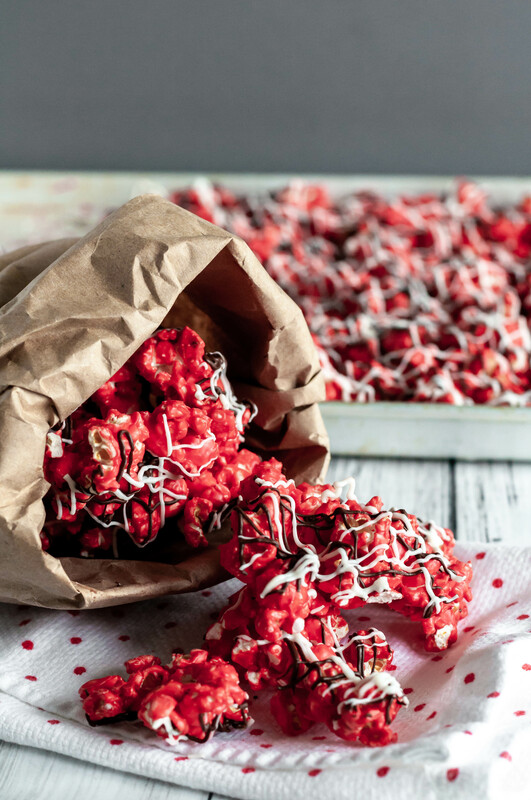 When I created this popcorn for the blog it obvs had to be red with black and white drizzles since those are my colors. If your team doesn’t boast white or black as a color, leave one of the drizzles off. Or if you need two colors to make it recognizable for your team (think Chiefs red and yellow), pick up both color candy melts and coat the popcorn in the main color then drizzle with the secondary color. Super easy and customizable. After the popcorn is coated in candy melts and beautifully drizzled, it does require some time to harden but if you are short on time a quick trip to the refrigerator will set it in less than 10 minutes. So really, you only need about 20 minutes from start to finish for this super festive snack. You can break it up into individual pieces if you want but I prefer to keep it in bigger chunks so you can really see the drizzles and so you get all the colors in each bite. Who doesn’t want a big hunk of that? The popcorn stays crisp under all that coating and the candy melts and chocolate add a creamy texture making it incredibly easy to take down in one sitting. So maybe you should make a double batch if you’re inviting more than a couple friends over. Place popped popcorn in a large bowl. Set aside. Line a large baking sheet with parchment paper. Set aside. Place candy melts in a microwave safe bowl. Melt according to package directions. Pour over the popcorn and stir until completely coated. Spread into a single layer on the prepared baking sheet. Set aside. Place dark chocolate chips in a microwave safe bowl. Microwave for 30 seconds then stir. Microwave another 30 seconds and stir. Once melted, pour into a ziptop bag and snip the smallest amount off the corner of the bag. Drizzle in a diagonal direction over the popcorn. Repeat this process with the white chocolate chips. Allow to harden at room temperature or place in the refrigerator for 10 minutes. Once hardened, break into chunks and store in an airtight container. *This post contains an affiliate link. If you purchase I may make a very small commission. For more information, check out my disclosure policy here.